The schutterij is the citizen militia responsible for the defense of the town. In times of war, they could be called up to defend the country. Schutterijen existed throughout the Netherlands from at least the 1500s. Regulations for the schutterijen were standardized in 1814. Male residents between the ages of 18 and 50 (from 1827: between 25 and 34) were elligible to serve. By law, 600 schutters were required per 20,000 residents. Schutterijen existed until 1901. Records for schutters can often be found in local archives. 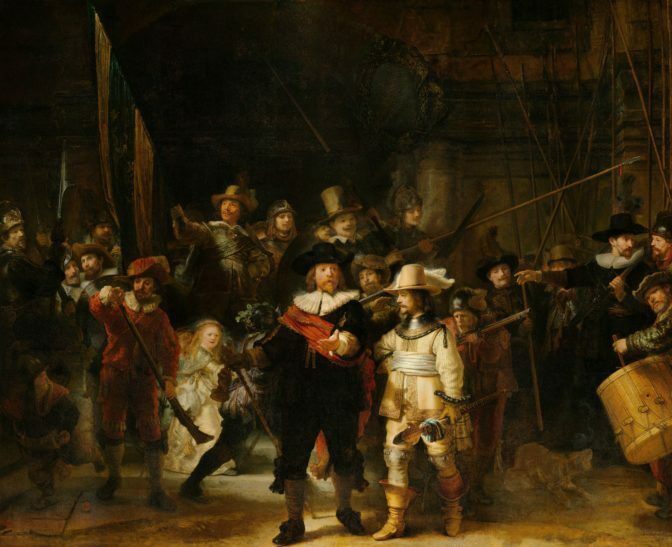 The schutters of ward II in Amsterdam, better known as the “Nachtwacht” [Night’s Watch]. Source: Redmer Alma and Paul Brood, editors, Drenten Gezocht: Gids voor stamboomonderzoek in Drenthe (The Hague: Centraal Bureau voor Genealogie, 1998), 179.